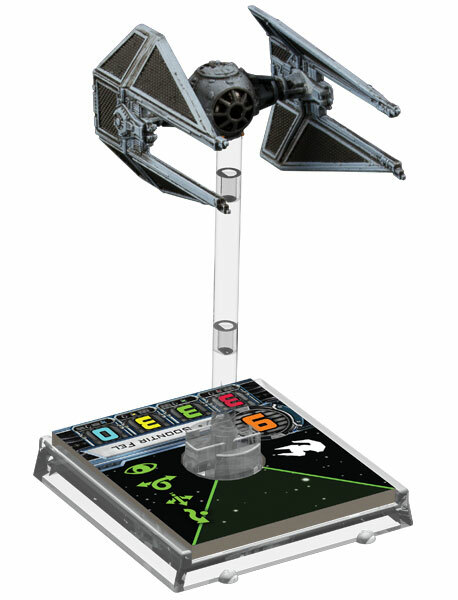 It has recently been discovered that there are large, higher resolution photos of all four ships in Wave 2 of X-Wing: Miniatures to be found on the Australian gaming website Milsims. Let’s take a closer look at these ships, shall we? First up is the Millennium Falcon. My first thought when I look at this picture is “Holy Crap!” Just look at all the detail included in this figure. It’ll definitely be worth the $30 that the two medium size ships will cost. Looking at the base you’ll notice that the pilot for this ship is Han Solo (other available pilots will be Chewie, Lando, and Nien Nunb) who has a Pilot Skill of nine. That’s as good as Wedge! Han can also perform the Focus or Target Lock actions. As for the stats of the actual ship, it’s Primary Weapon has a firepower of three which seems a bit low to me. I would think with dual quad lasers, the Falcon should put out a bit more damage than an X-Wing. Maybe it’s a balance issue? Also notice the new circular symbol with an arrow on the base? I can only assuming that this is to remind players that the Falcon’s weapons are mounted on turrets and can thus shoot 360 degrees. The cone of the forward firing arc will likely only be used for missile weapons. Another stat that many people are finding equally odd is the Agility value of only one. However, this seems to fit with the ship to me. Remember in A New Hope when they are being attacked by the TIE Fighters as they are fleeing the Death Star? In that scene they are constantly being pounded by the TIEs and rather than dodge the fire, they instead rely on the heavy shields and armor to protect them while they brought their superior firepower to bear. And just look at those stats for Hull and Shields: eight hull and five shields. It’s going to take an enemy a long time to burn through all of that. But an un-upgraded ship will cost you somewhere in the forty point range to play, which will be nearly half your squad. You’ll have to decide which you want more: bigger guns, or more guns. Along with the Falcon, the Rebels will also receive the RZ-1 A-Wing interceptor. This small and agile ship has an Agility of three, a Hull of two, two Shields, and it’s Primary Weapon fires for two damage dice. We can see on this base that it is being piloted by Tycho Celchu, who has an Ability of 8. The A-Wing will also come with two generic pilots and one other unique pilot. A-Wings, sadly will not be able to utilize any of the very powerful Astromech upgrades, but this offset by the addition of the new Boost action. While FFG has yet to release any details on what exactly the Boost action will do, it seems to allow the A-Wing (and the TIE Interceptor) to utilize it’s superior speed to make an additional move, which could tactically be even bigger than the Barrel Roll ability. 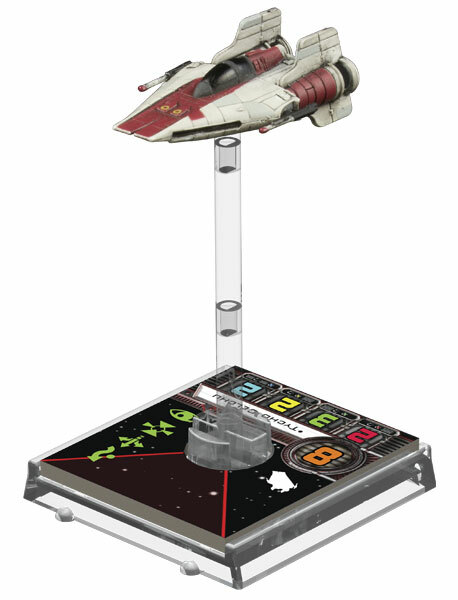 Interestingly enough, A-Wings appear to come with more stress tokens than any other ship and the official description even says that “Rebel aces like Tycho Celchu push this sleek starfighter to its limits as they seek to gain every advantage it can give them…” Perhaps the A-Wing will have several mechanics that revolve around performing very difficult, stressful maneuvers? Here we have the TIE Interceptor who, with the Evade, Boost, and Barrel Roll actions, is the most maneuverable ship on the battle field. The TIE/In will come with Baron Soontir Fel, the leader of the deadly 181st Imperial Fighter Wing, as it’s elite pilot and he has a Pilot Ability of nine. The ship itself possesses an Agility, Hull, and Primary Weapon all with the value of three, making it slightly more resilient than your standard TIE Fighter. And last we have the Slave I. This Firespray-class ship is Imperial’s medium size ship to be included in wave two. The ship has a Weapons value of three, two agility, six hull, and four shields. 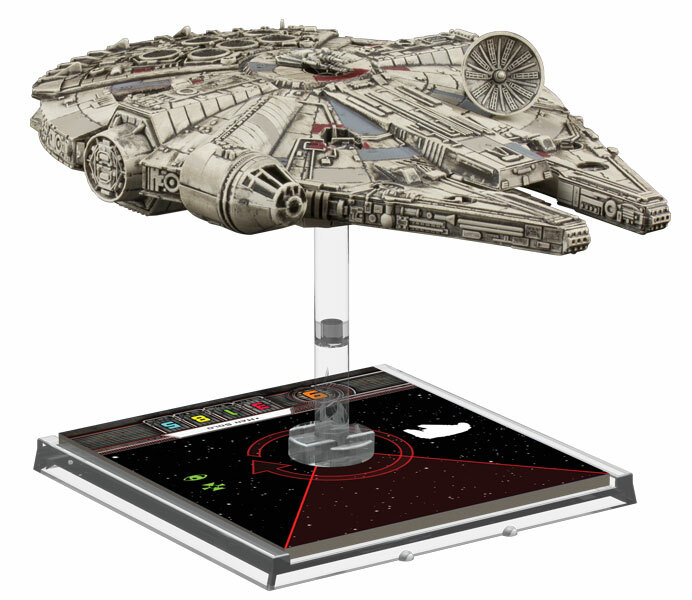 So it is slightly more maneuverable than the Falcon, but less resilient. When Boba Fett pilots he has a Piloting Ability of eight. The most interesting part of the Slave I’s base is that you can see the second firing arc behind the ship. So while missiles will only fire forward, you’ll be able to fire your lasers at those pursuing you. 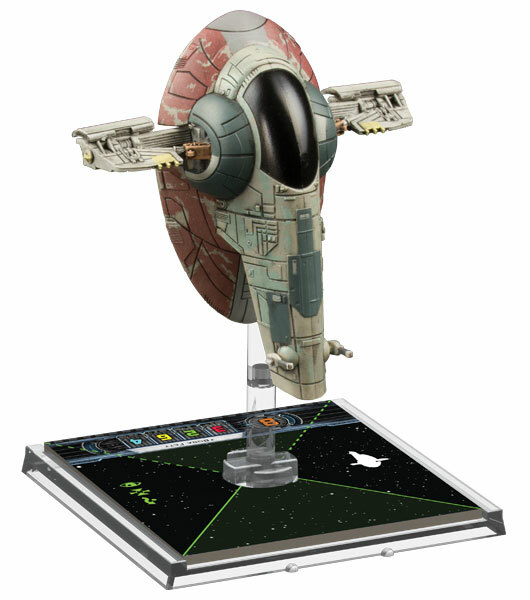 Like I said above, this and the Falcon are medium sized ships. The most common question people ask about the medium ships is, “How big are they compared to the regular fighters?” So below I made an attempt to show the scale differences by matching up the widths between the pegs on the bases. So, while this is not 100% accurate, it should be pretty close. All four of these ships are slated to be released sometime during the fourth quarter of 2012. I know! Can’t wait to get my hands on these things! Wow these look awesome. Hopefully the wife hooks it up and gets me the core set for my birthday next week. Can’t wait to play these and get my hands on the Falcon & Slave 1. I saw these and Celebration VI and instantly fell in love! I can’t wait to dig into the rules and grab a friend to play a round or two.